There are times when you need to be funky, and there are times when you need to go for complete elegance. However, that doesn’t mean that you have to settle for “boring” when choosing your dress shoes. You can go for a unique design while preserving the elegance and formality. It can be difficult to find just the right pair. Sometimes, they may not go with the suit. Other times, they may not go with the environment. Of course, they might work with the first two – but if they’re not your style, they could still end up to be the wrong choice. With this in mind, we are going to review the Asher Green Men’s Two-Tone Calf Leather Shoes and see if they are appropriate for any occasion or not. We will review them in terms of looks, durability, and comfort, therefore making sure that this purchase is worth the money. Made from full-grain calfskin leather, these two tone mens shoes were made to be durable. The leather was treated properly so as to not get damaged easily – and all these shoes will need is a bit of shoe polish every now and again. The material in itself is thick, so even if you’re caught by rain or step in a puddle, your feet should not get wet. The advantage of leather is that it can adapt to the weather conditions. In winter, for instance, it can easily keep the cold out of your shoes. Similarly, the leather lining will make sure you stay warm. All moisture is wicked away so that by the end of the day, your feet will feel dry, and comfortable. All that’s left for you to pick are the correct pair of socks, and you can say goodbye to discomfort. While these Oxford shoes are perfect for any kind of formal event, they are far from plain. Following a two-tone style that mixes both brown and black, they have a Western feel while still being modern. You may choose from burgundy, tan, and cognac colors – each of them mingling soft colors that will go well with almost every formal outfit. Unlike most shoes of this type that have a flower or spiraling pattern, this one has a classic perforated one that resembles lace. It looks simple and yet stylish enough to receive many compliments. Due to the fact that they are made of leather, the fit is good as long as you get the right size. The break-in period for these shoes should be brief as they’ll mold around your foot fast enough so that you won’t end up with blisters and pain. 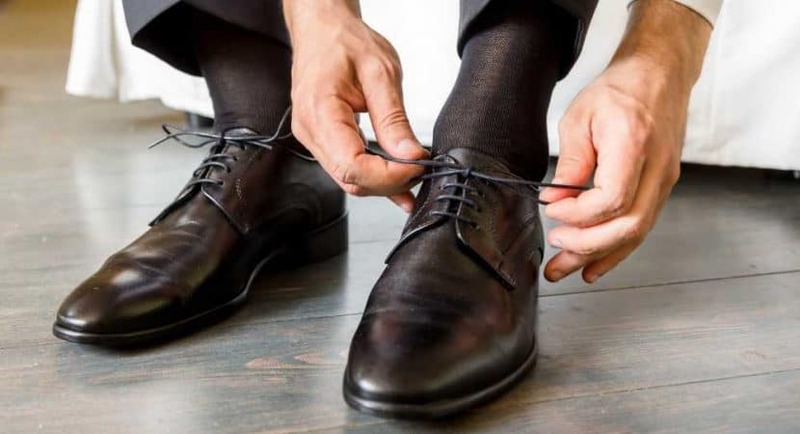 Having five rows of shoelace holes, these dress shoes will provide a very snug and comfortable fit. You may tie them just as tight or as loose as you want them, and they will stay comfortable for the rest of the night. Plus, the material from which they are made is highly durable, so you will not have to worry that they will rip if you pull too hard. The sole of the Asher Green shoe is made from a durable synthetic material that promises a long-lasting use. In most places, the surface is flat – so as to avoid leaving marks on the floor. However, there are some areas that have a certain pattern meant to prevent any incidents on slippery surfaces. These Oxford style formal shoes are a perfect match for any kind of tuxedo – as long as you choose a friendly color palette. You may wear them with a nice traditional suit, as well as a smart casual outfit – but you have to accessorize properly. You have the ability to choose any size between 7.15 and 15 – so no matter what size you wear, you will be covered. Compared to other leather dress shoes such as 3DM Lifestyle, for example, the Asher Green dress shoes are on the more affordable side. Depending on the model that you choose, as well as the size, you’ll pay about half the price and receive full quality leather in return. 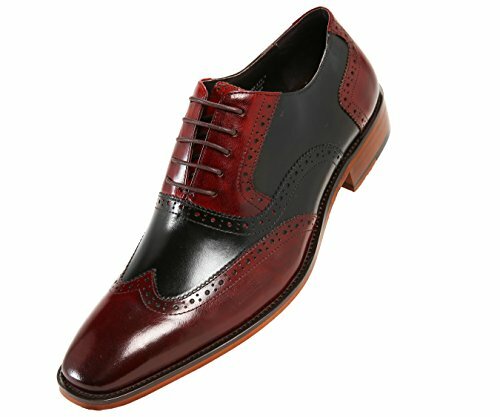 It’s rare that you’ll find a pair of such good quality leather shoes at this price. However, previous customers did mention that the Asher green shoes run rather small – so you might want to order one size up when purchasing these items. They have the same fit expectancy as most shoes of this type – perhaps even a slightly better one. So, as long as you don’t have any special requirements, your normal shoe size should fit fine. It has the same style and comfort such as the Bolano Men’s Two-Tone Metallic Black Smooth Lace up Oxford Dress Shoes– the difference being that the Asher Green ones are made from leather. Plus, instead of going for plain tuxedo dress shoes such as the Faranzi, you will be going for special-looking models such as the Asher Green Men’s Two-Tone Calf Leather Shoes. They are also easier to maintain, and they will only need an occasional weekly touch-up with a protective polish. Considering the quality of these dress shoes, an Asher Green pair is a very good investment. Not only are they inexpensive and sold almost at the price of a faux leather pair, but they are also very durable. As long as you properly maintain them, these dress shoes should definitely last you for at least a couple of years. They are usually true to size – but just to be on the safe side, you might want to order a size bigger if you have wider feet. The insole also provides plenty of cushion, so you’ll be able to walk long miles with them. Therefore, if your job requires you to be on your feet a lot, then these should work just fine for you. If you’re looking for something durable, elegant, and comfortable to wear on a daily basis, then the Asher green dress shoes should be a top choice. You can expect to receive a lot of compliments for them.